Big Spraddle Creek, Virginia, U.S.
Ralph Edmond Stanley was born, grew up, and lived in rural Southwest Virginia—"in a little town called McClure at a place called Big Spraddle, just up the holler" from where he moved in 1936 and lived ever since in Dickenson County. The son of Lee and Lucy Stanley, Ralph did not grow up around a lot of music in his home. As he says, his "daddy didn't play an instrument, but sometimes he would sing church music. And I'd hear him sing songs like 'Man of Constant Sorrow,' 'Pretty Polly' and 'Omie Wise.'" I got my first banjo when I was a teenager. I guess I was 15, 16 years old. My aunt had this old banjo, and Mother bought it for me ... paid $5 for it, which back then was probably like $5,000. [My parents] had a little store, and I remember my aunt took it out in groceries. She had 11 brothers and sisters, and all of them could play the five-string banjo. She played gatherings around the neighborhood, like bean stringin's. She tuned it up for me and played this tune, "Shout Little Luly," and I tried to play it like she did. But I think I developed my own style of the banjo. ... my daddy and Carter picked me up from the (station), and Carter was playing with another group, Roy Sykes and the Blue Ridge Mountain Boys, and they had a personal appearance that night. So I sung a song with Carter on the radio before I even got home. After considering a course in "veterinary", he decided instead to throw in with his older guitar-playing brother Carter Stanley (1925–1966) to form the Clinch Mountain Boys in 1946. Drawing heavily on the musical traditions of the area, which included the unique minor-key singing style of the Primitive Baptist Universalist church and the sweet down-home family harmonies of the Carter Family, the two Stanley brothers began playing on local radio stations. They first performed at Norton, Virginia's WNVA, but did not stay long there, moving on instead to Bristol, Virginia, and WCYB to start the show Farm and Fun Time, where they stayed "off and on for 12 years". At first they covered "a lot of Bill Monroe music" (one of the first groups to pick up the new "bluegrass" format). They soon "found out that didn't pay off—we needed something of our own. So we started writing songs in 1947, 1948. I guess I wrote 20 or so banjo tunes, but Carter was a better writer than me." When Columbia Records signed them as The Stanley Brothers, Bill Monroe left in protest and joined Decca. Later, Carter went back to sing for the "Father of Bluegrass", Bill Monroe. Ralph Stanley gave his opinion on Bill Monroe's apparent change of heart: "He [Bill Monroe] knew Carter would make him a good singer. . . Bill Monroe loved our music and loved our singing." The Stanley Brothers joined King Records in the late '50s, a record company so eclectic that it included James Brown at the time. In fact, James Brown and his band were in the studio when the Stanley Brothers recorded "Finger Poppin' Time". "James and his band were poppin' their fingers on that" according to Ralph. At King Records, they "went to a more 'Stanley style', the sound that people most know today." Ralph and Carter performed as The Stanley Brothers with their band, The Clinch Mountain Boys, from 1946 to 1966. Ralph kept the band name when he continued as a solo after Carter's death, from 1967 to the present. After Carter died of complications of cirrhosis in 1966, after ailing for "a year or so", Ralph faced a hard decision on whether to continue performing on his own. "I was worried, I didn't know if I could do it by myself. But boy, I got letters, 3,000 of 'em, and phone calls . . . I went to Syd Nathan at King and asked him if he wanted me to go on, and he said, 'Hell yes! You might be better than both of them.'" He decided to go it alone, eventually reviving The Clinch Mountain Boys. Larry Sparks, Roy Lee Centers, and Charlie Sizemore were among those with whom he played in the revived band. He encountered Ricky Skaggs and Keith Whitley arriving late to his own show: "They were about 16 or 17, and they were holding the crowd 'til we got there. . . They sounded just exactly like (the Stanley Brothers)." Seeing their potential, he hired them "to give 'em a chance", though that meant a seven-member band. Eventually, his son, Ralph Stanley II, took over as lead singer and rhythm guitarist for The Clinch Mountain Boys. What happened is, somebody traded me off—they used my popularity and money to elect somebody else. I was done dirty. And I'm so proud that I was done dirty, because if I had been elected ... I woulda had a job to do ... maybe woulda finally quit. So that's one time I was done dirty and I want to thank them for it now. T-Bone Burnett had several auditions for that song. He wanted it in the Dock Boggs style. So I got my banjo and learned it the way he did it. You see, I had recorded "O Death" three times, done it with Carter. So I went down with my banjo to Nashville and I said, "T-Bone, let me sing it the way I want to sing it," and I laid my banjo down and sung it a cappella. After two or three verses, he stopped me and said, "That's it." With that song, Stanley won a 2002 Grammy Award in the category of Best Male Country Vocal Performance. "That put the icing on the cake for me," he said. "It put me in a different category." Known in the world of bluegrass music by the popular title, "Dr. Ralph Stanley" (after being awarded an honorary Doctorate of Music from Lincoln Memorial University in Harrogate, Tennessee in 1976), Stanley was inducted into the International Bluegrass Music Hall of Honor in 1992 and in 2000, and became the first person to be inducted into the Grand Ole Opry in the third millennium. He joined producers Randall Franks and Alan Autry for the In the Heat of the Night cast CD Christmas Time's A Comin’, performing "Christmas Time's A Comin'" with the cast on the CD released on Sonlite and MGM/UA; it was one of the most popular Christmas releases of 1991 and 1992 with Southern retailers. He was featured in the Josh Turner hit song "Me and God" released in 2006. In 2006, he was awarded the National Medal of Arts. On November 10, 2007, Stanley and the Clinch Mountain Boys performed at a rally for presidential candidate John Edwards in Des Moines, Iowa, just before the Democratic Party's annual Jefferson-Jackson Day Dinner. Between renditions of "Man of Constant Sorrow" and "Orange Blossom Special", Stanley told the crowd that he had cast his first vote for Harry S. Truman in 1948 and would cast his next for John Edwards in 2008. Country singer Dwight Yoakam has stated that Ralph Stanley is one of his "musical heroes." Stanley's autobiography, Man of Constant Sorrow, coauthored with the music journalist Eddie Dean, was released by Gotham Books on October 15, 2009. In 2012, Stanley was featured on several tracks of the soundtrack for Nick Cave's film Lawless, with music by Cave and Warren Ellis. His solo track "White Light/White Heat" is prominent in several scenes of the movie. Stanley maintained an active touring schedule; appearances in recent years have included the 2012 Muddy Roots Music Festival in Cookeville, TN, and the 2013 FreshGrass Festival in North Adams, MA. In June 2013, he announced a farewell tour, scheduled to begin in Rocky Mount, NC, on October 18 and extending to December 2014. However, upon notification of being elected as a fellow of the American Academy of Arts and Sciences (awarded October 11, 2014) a statement on his own website appeared, saying that he would not be retiring. On June 23, 2016, Stanley died as a result of skin cancer. Stanley created a unique style of banjo playing, sometimes called "Stanley style". It evolved from Wade Mainer style two-finger technique, later influenced by Scruggs style, which is a three-finger technique. "Stanley style" is distinguished by incredibly fast "forward rolls", led by the index finger (instead of the thumb, as in Scruggs style), sometimes in the higher registers using a capo. In "Stanley style", the rolls of the banjo are continuous, while being picked fairly close to the bridge on the banjo, giving the tone of the instrument a very crisp, articulate snap to the strings as the player would strike them. Lifted: Songs of the Spirit (2002, Sony/Hear Music) – "Listen to the Shepherd"
Re:Generation Music Project soundtrack (2012) – "Wayfaring Stranger"
Stanley was widely known in the world of bluegrass music by the popular title, "Dr. Ralph Stanley" after being awarded an honorary Doctorate of Music from Lincoln Memorial University in Harrogate, Tennessee, in 1976. He was inducted into the International Bluegrass Music Hall of Honor in 1992 and in 2000. He became the first person to be inducted into the Grand Ole Opry in the third millennium. His work was featured in the 2000 film O Brother, Where Art Thou?, in which he sings the Appalachian dirge "O Death." That song won him a 2002 Grammy Award in the category of Best Male Country Vocal Performance. The Virginia Press Association made him their Distinguished Virginian of the Year in 2004. The Ralph Stanley Museum and Traditional Mountain Music Center opened in Clintwood, Virginia in 2004. He was awarded the National Medal of Arts in 2006, the nation's highest honor for artistic excellence. The Virginia legislature designated him the Outstanding Virginian of 2008. He received a second honorary Doctorate of Music degree from Yale University on May 19, 2014. He became an elected fellow of the American Academy of Arts and Sciences on October 11, 2014. From the January 2, 2015 death of Little Jimmy Dickens until his own death, Stanley was the oldest living member of the Grand Ole Opry. 1 2 3 4 "Old-Time Man" interview by Don Harrison June 2008 Virginia Living, p. 55. 1 2 3 4 5 6 7 8 "Old-Time Man" interview by Don Harrison June 2008 Virginia Living, p. 56. ↑ "Old-Time Man" interview by Don Harrison June 2008 Virginia Living, p. 56-7. 1 2 3 4 "Old-Time Man" interview by Don Harrison June 2008 Virginia Living, p. 57. ↑ "Ralph Stanley II". Ralphstanleyii.com. Retrieved September 17, 2012. ↑ "Ralph Stanley & Dwight Yoakam- Bluegrass Duet". YouTube. September 28, 2008. Retrieved September 17, 2012. ↑ Stanley, Ralph; Dean, Eddie (October 15, 2009). Man of Constant Sorrow: My Life and Times. Penguin Publishing Group. ISBN 978-1-101-14878-5. 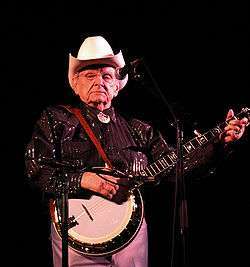 ↑ "Ralph Stanley announces his final tour". Bluegrass Today. June 26, 2013. Retrieved July 15, 2014. ↑ Freeman, Jon. "Dr. Ralph Stanley Announces Farewell Tour". Country Weekly. Retrieved October 2, 2013. ↑ "Dr. Ralph Stanley". drralphstanleymusic.com. 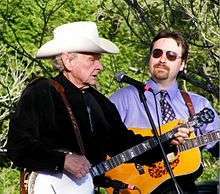 ↑ "Bluegrass legend Ralph Stanley dies at the age of 89". Wdbj7.com. June 22, 2016. Retrieved June 22, 2016. ↑ "Ralph Stanley". Praguefrank's Country Music Discographies. Retrieved January 19, 2010. ↑ "Ralph Stanley". Discography of Bluegrass Sound Recordings, 1942–. ibiblio. Retrieved January 19, 2010. ↑ Musicians mix genres in 'Re:Generation' documentary, USA Today, February 16, 2012. Retrieved March 13, 2012. ↑ "Ralph Stanley – Living Legends – Awards and Honors – About the Library (Library of Congress)". Loc.gov. February 25, 1927. Retrieved September 17, 2012. ↑ "Ralph Stanley Receives Honorary Doctorate From Yale University". Country Weekly. May 20, 2014. Retrieved May 28, 2014. ↑ "Opry's oldest member is now Ralph Stanley". WIXY. January 6, 2015. Retrieved January 8, 2015.